Granny’s Classic Homemade Mac and Cheese is the best mac and cheese recipe you will find! 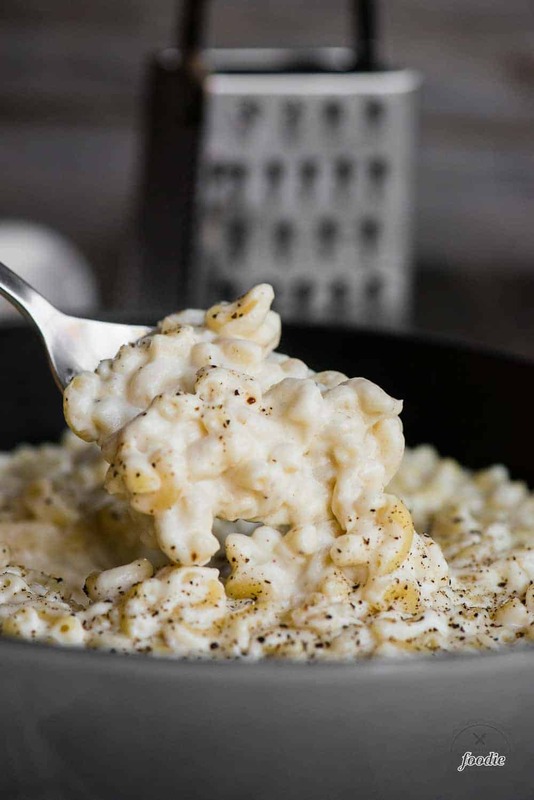 This creamy and easy stovetop mac and cheese is SO GOOD! Granny’s Classic Homemade Mac and Cheese is not your typical run of the mill mac and cheese. It is nothing like the boxed macaroni and cheese with a powdered cheese packet. This mac and cheese is the opposite of light and healthy. No. This mac and cheese is a full on commitment. It is packed with butter, milk, heavy cream, and the most wonderful sharp cheddar and gruyere cheese. I threw in a few secret ingredients that really make this classic stove top mac and cheese recipe stand out above all the rest. 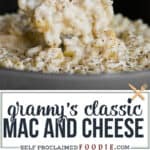 We’ve been eating Granny’s Classic Homemade Mac and Cheese pretty much my whole life but I’ve put a few of my own twists on the recipe over the years that even impressed Granny, herself! Why is this the BEST mac and cheese recipe of all time? The sauce is ridiculously rich, creamy, and decadent. 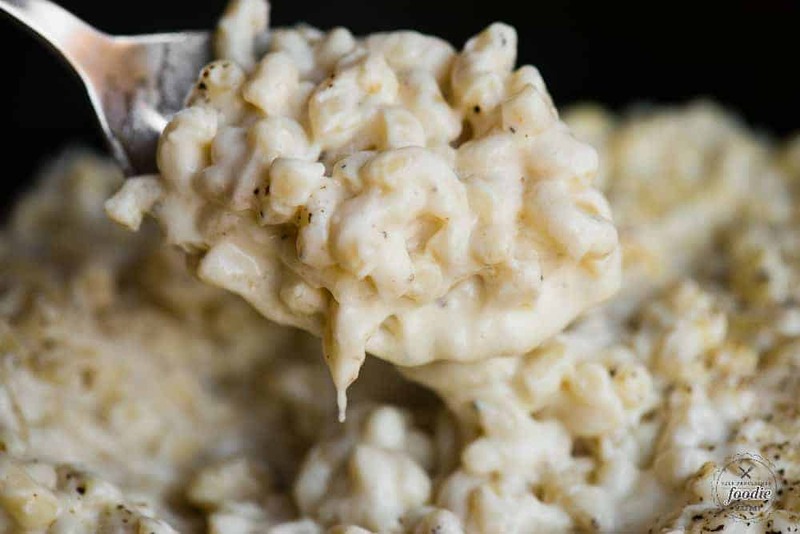 Sure, you can make the sauce for mac and cheese with just milk, but combining whole milk with heavy cream really sets this recipe over the edge. It’s not baked. I know, I know. You might be one of those people who thinks baked mac and cheese is the way to go, and on some days I won’t argue. I even considered going the extra step to make this recipe a baked mac and cheese. But let me tell you – this mac and cheese recipe is absolutely perfect as is. No need to throw breadcrumbs on top and bake it to make it even better (although I’ll tell you below just how to do that below in case you prefer it to be baked). It all comes down to the sauce and, believe it or not, there is some technique involved in achieving the creamiest sauce for your macaroni. Be sure to allow your roux to develop a bit and turn golden brown. You’ll know when it’s done because it will start to smell like a freshly baked pie crust. After you add the milk and the heavy cream, heat it just until it starts to bubble around the edges, then reduce the heat to low. I can’t tell you how many times I’ve been distracted and let my milk mixture boil to the point where it got a bit chunky. Don’t do that. Another trick to super creamy mac and cheese is to grate the cheese yourself. If you use shredded cheese from a bag, it’s almost always coated in something to prevent sticking. I find that freshly grated cheese melts the best, thus making the creamiest mac and cheese. Make sure the temperature of the milk mixture isn’t too hot when you add the cheese. You just want the cheese to gently melt. Sometimes I even remove the sauce completely from the heat before I add the cheese just to ensure that it melts slowly. The result will be a heavenly creamy cheese sauce for your macaroni. Okay. I still believe that this mac and cheese is best straight out of the pan and into your mouth. But, if you feel strongly that in order for mac and cheese to be the BEST mac and cheese ever it has to be baked, I’ll tell you how to do it. Preheat your oven to 400 degrees F. Alternatively, you can use the broiler if the mac and cheese is still hot from the stove. 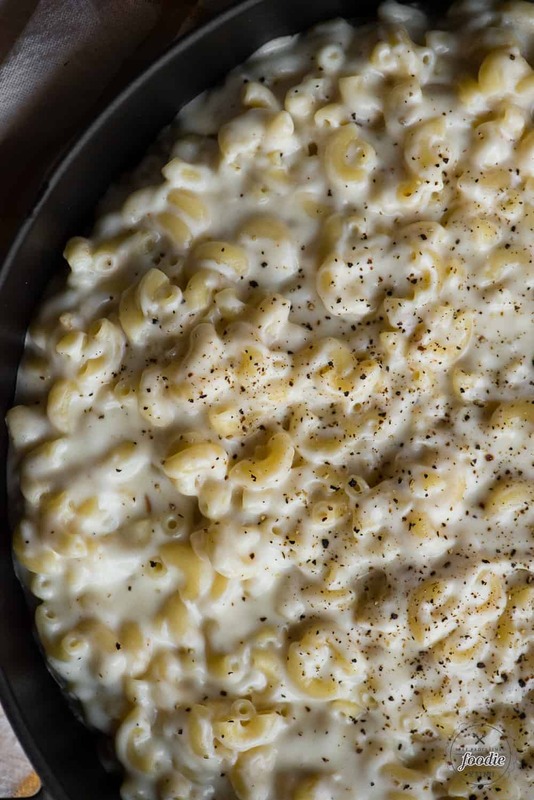 Transfer the mac and cheese from your pot to a casserole dish. 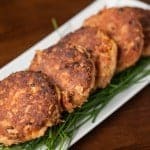 In a small bowl, combine 4 tablespoons melted butter, 4 tablespoons panko bread crumbs, 4 tablespoons grated parmesan cheese, and about a half teaspoon of garlic herb seasoning for good measure. If you really like the topping on baked mac and cheese, go ahead and double or triple these amounts. No judgement here. Sprinkle on top of your mac and cheese and pop the casserole dish into the oven. It should only take 5-10 minutes for the top to start turning golden brown and smelling wonderful. What cheese is best for homemade mac and cheese? I am a firm believer that equal parts of sharp cheddar and gruyere are the best cheeses for mac and cheese. Cheddar adds the flavor and richness that every mac and cheese deserves and gruyere melts like a dream. Monterey jack melts really nicely and goes well with mac and cheese. You can spice things up with a pepper jack or habanero jack too. Mozzarella is another good melty cheese. 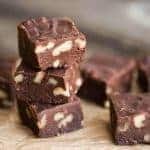 I’d probably recommend mixing it with an Italian hard cheese like parmesan or pecorino to give it a bite. Smoked cheddar will blow your mind if you put it in your mac and cheese. Trust me. The recipe couldn’t be more easy. First step is to cook your macaroni. Be sure to bring that water to a roaring boil and add at least a full tablespoon of salt to the water. You also want to make sure that you use enough water so that it continues to boil even after you add the macaroni (or shortly thereafter). I prefer to cook my macaroni al dente so it has a bit of a bite. While the macaroni is cooking you can make the cheese sauce. This simple process starts with a roux, then you add the milk and cream and heat until it starts to bubble. At this point you’ll add the garlic and seasonings. The final step is to add the grated cheese and watch it melt. To serve, simply toss your drained pasta in the sauce. Be sure not to rinse the macaroni after you drain it. The sauce will absorb and stick to the macaroni better if you don’t rinse the pasta. What is the best way to reheat homemade mac and cheese? Keep this rule in mind: The more fat there is in your creamy pasta recipe, the harder it is to reheat. Let me explain. Things like cheese and heavy cream will turn into a greasy mess if they’re heated too hot and too quickly. A rich decadent homemade mac and cheese recipe like this tastes fantastic reheated, but only if you do it correctly. To reheat homemade mac and cheese in the microwave, simply loosely cover to prevent splattering and then reheat on 50% power (or even less) in 1 minute increments. After each minute, give it a good stir to ensure the mac and cheese is heating evenly. Just be sure to heat low and slow and stop as soon as it hits the right temperature. To reheat homemade mac and cheese on the stove top, place it in a covered sauce pan and heat over low heat stirring often. Love mac and cheese recipes? Granny's Classic Homemade Mac and Cheese is the best mac and cheese recipe you will find! 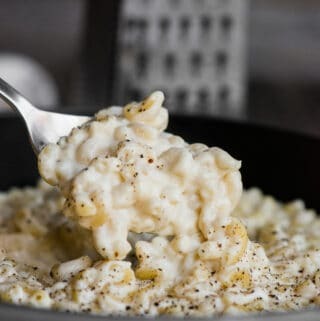 This creamy and easy stovetop mac and cheese is SO GOOD! Cook the pasta to al dente doneness in large pot of heavily salted water (at least 1 tablespoon of salt with a generous amount of water). You want the pasta slightly under cooked because it will continue cooking in the sauce and you want it to have a nice "bite". Reserve some of the pasta water in a small measuring cup for later. Drain, do not rinse, and set aside. Melt butter in heavy bottom saucepan or dutch oven. 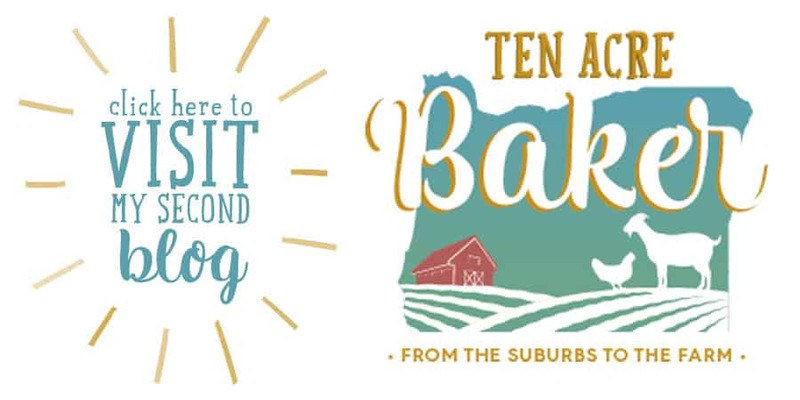 Once butter is melted, whisk in flour over medium heat and continue whisking for about 1 minute until bubbly and golden. 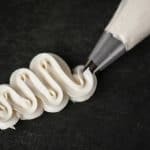 Whisk in the milk and heavy cream until nice and smooth. Continue whisking over medium high heat. Once the mixture starts to gently bubble around the edges, reduce heat to low. Whisk in roasted garlic, ground mustard, taco seasoning, salt and pepper. Add the grated cheddar and Gruyere cheese to the sauce mixture. Stir continuously until completely melted. Stir in the cooked pasta until combined and pasta is fully coated with the cheese sauce. If sauce is too thick, stir in some of the reserved pasta water. 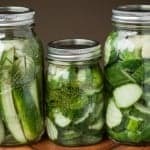 Serve immediately while it's very hot. Cheese sauce will thicken as it cools. A big bowl of Grandmas homemade Mac n cheese is the best!!! So comforting and delicious. The only mac and cheese recipe anybody needs! The roasted garlic makes all the difference, this is sooooo yummy! This looks like the perfect mac and cheese! So creamy and cheesy! Granny knows her stuff. This was delicious!